Make sure you follow along! Google is hosting its big ‘Made by Google’ keynote presentation on October 9th where the tech giant is expected to reveal a variety of new devices. We’ll likely catch a glimpse of the Pixel 3, a new version of Google’s Pixelbook and possible even new Google Home devices. The event begins at 8am PT/11am ET and can be livestreamed on YouTube and Twitter. MobileSyrup will be on the ground at the keynote bringing you all the news directly from the show floor. When users visit the keynote’s YouTube page right now, they’re presented with the option to set a Google Assistant reminder for a 20-minute warning to be sent out before the keynote. 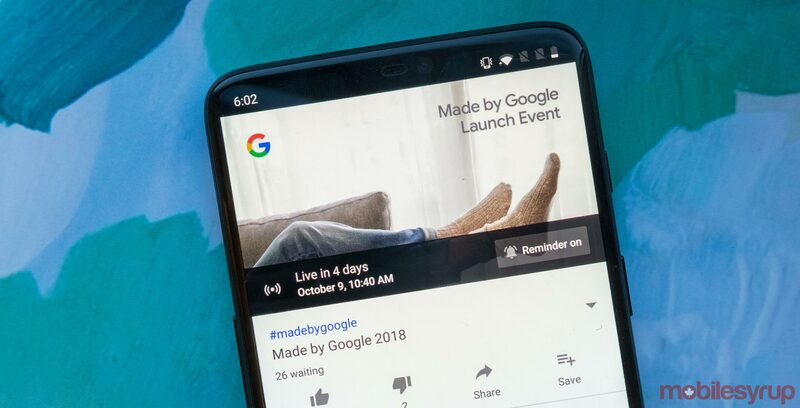 Make sure to follow MobileSyrup on Twitter, Facebook, Google Plus, Flipboard and of course, directly on our site’s homepage, to keep up to date with the Canadian-specific news from the Made by Google event.